Dr. Bob Musil, RCC President was the featured speaker at a luncheon grand rounds at the Penn State Medical Center in Hershey, PA. Dr. Musil was invited by the Student Physicians for Social Responsibility chapter and their faculty sponsor, Dr. Peter Lewis. Musil spoke about the public health views and political engagement of Rachel Carson. The Penn State Medical Center is now also an affiliated Rachel Carson Campus. 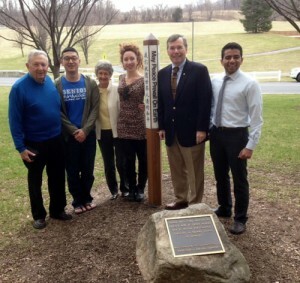 Active medical students at PSU-HMC focus on environmental and peace issues. At left, Dr. Musil stands with with Dr. Jim Jones and medical student leaders at the Medical College Peace Pole he helped dedicate.